“Whatever Comes Next” looks at the life of Annemarie Mahler, shown here with her dog, Leah. IU Germanic Studies professor Hildegard Elisabeth Keller is a medieval scholar. But these days, a completely different form of illumination is behind her work. 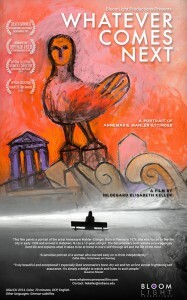 Her documentary film “Whatever Comes Next” will be screened at 6:30 p.m. April 26 at Indiana University Cinema. A question-and-answer session with the filmmaker will follow. 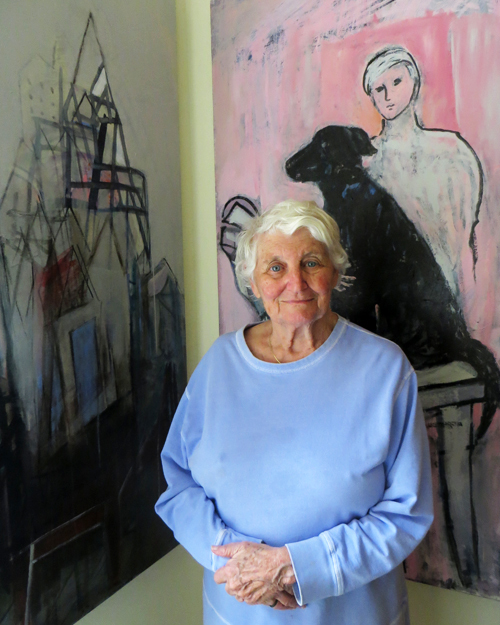 The feature is an imaginative look at the life of Annemarie Mahler, a painter who has lived in Bloomington since 1955. Mahler, now 89, is an extraordinary woman. Annemarie Ettinger was a schoolgirl from Vienna on a carefree ski trip when the trajectory of her life changed forever. The year was 1938 when Germany annexed Austria. She and her family had to leave their hometown, moving first to Holland and then to New York. But the forced exile is only one aspect of a life filled with learning, love and art. Keller has just returned from Florida, where “Whatever Comes Next” had its U.S. premiere with screenings at the partner festivals Through Women’s Eyes and the Sarasota Film Festival. Hildegard Elisabeth Keller is a medievalist and a filmmaker. In 2011, Keller made “Der Ozean im Fingerhut,“ or “The Ocean in a Thimble,” an experimental film about “four women beyond time.” The German-language film is based on her audio book about a fictitious meeting of four mystics from different centuries: Hildegard von Bingen, Mechthild von Magdeburg, Hadewijch and Etty Hillesum. 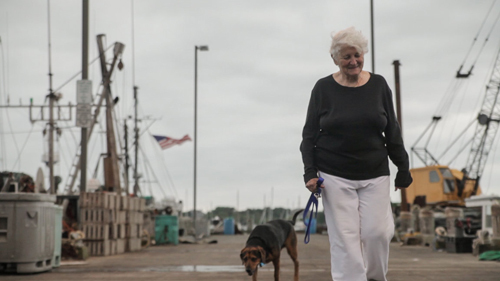 Her new live-action documentary was filmed in Bloomington and in Woods Hole, the Cape Cod town where Mahler keeps a summer home, but the film also is international in scope. “Two continents were involved,” Keller said. Keller and cinematographer Carter Ross, a 2013 IU alumnus, completed the post-production work in Switzerland, including the addition of Olav Lervik‘s original score for the film. 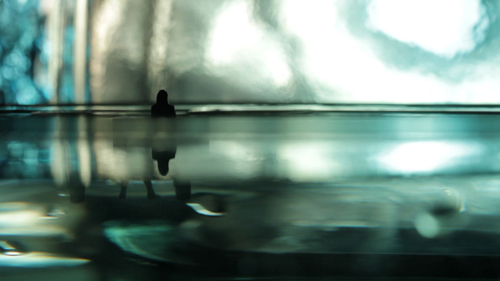 And in November 2014, the film had its world premiere in Keller’s Swiss hometown, Wil. After Annemarie completed high school in New York, she went on to study art and English at Hunter College, part of the City University of New York, at a time when tuition was $8 a semester. 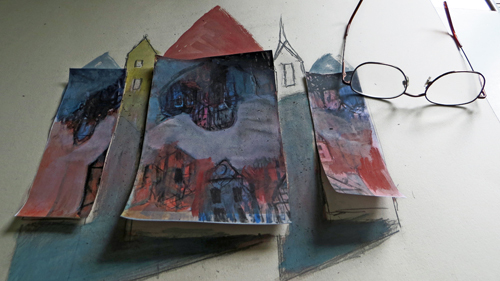 A collage is in progress in Mahler’s studio. After a visit to Berkeley, she decided to continue her studies there, and soon met Henry R. Mahler. Amazingly, they had attended the same grammar school in Austria, but had not known each other as children. The two were introduced on Halloween, he proposed on Christmas and they were married on Groundhog Day. “We understood each other perfectly. We weren’t ‘other’ to each other. We knew each other perfectly from the very beginning,” she said. The Mahlers came to Indiana University after five years at the University of Wisconsin and fell in love again, this time with Bloomington. Annemarie Mahler is an accomplished painter. Henry was a noted biochemist and became a distinguished professor in the IU Department of Chemistry. But by then, her husband had survived a serious cancer scare. As a mother of three children, she needed the security of her own career as an academic. She continued her art studies at IU. “I became Henry Hope’s graduate assistant,” she said. Hope was the head of the school and a national figure in art. While he traveled extensively, she taught his art history classes. Mahler eventually earned her Ph.D. in comparative literature and began teaching at the University of Cincinnati, commuting two days a week from her Bloomington home. Henry defied the odds and lived until 1983. And through it all, Annemarie never lost her love — and need — of painting. For her it was a meditation, like yoga. Keller’s film is a layered look at Annemarie Mahler’s life. It moves from the deep past into the present and in between its many facets. But mostly, it tries to capture her as she sees herself — as an artist. 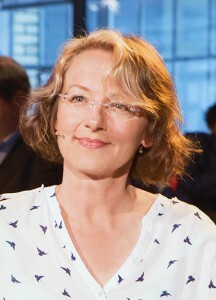 In the film, Keller allows Mahler’s life to narrate itself in what she calls “an Alice-in-Wonderland” fashion. “Painting is who I am,” Mahler said. “When it comes to painting, I really have nothing to say. Both the filmmaker and her subject are bold, creative women whose artistic visions do not always correspond exactly. 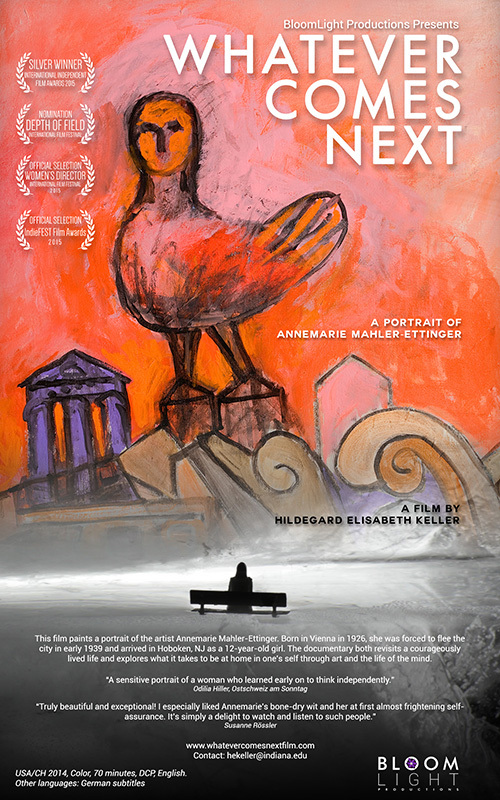 The Midwest premiere of “Whatever Comes Next” will be at 6:30 p.m. April 26. A question-and-answer session with Keller will follow. Tickets are required, but free of charge. Tickets for all IU Cinema films can be obtained at the IU Auditorium box office from 10 a.m. to 5 p.m. Monday through Friday; at the cinema one hour before any screening; or by phone at 812-855-1103 for a $10 service fee per order.